Can you please make this into a 1.13 project? 1.12.2, please!! sorry for a lot of people begging for it, but it would be appreciated by us all!! Will the 1.12.2 version come out soon? Probably not. Between hardly playing Minecraft in the past 6 months (if I ever start playing a 1.12 pack, there will almost certainly be an update within the week), and dreams of API improvements (ideally, I'd want to at least stabilize anything currently partially-implemented before updating to a Minecraft version with active mod development, so that if any other mods decide to implement CraftGuide compatibility, they don't have to touch any of the less convenient, older interfaces. Also so that there's no risk of someone using an early CraftGuide version lacking an API addition alongside a mod expecting that functionality), I haven't really been thinking about updates. I currently have a PO2:R instance of 1.7.10 that I play on occasion, so if I ever complete or abandon it, the pack I replace it with will probably drive updates once more. Then again, maybe even the current pack I'm playing will eventually lead to new features (there *are* some annoying things. At the very least, I'm starting to seriously consider an undo/redo on the filter, after building a complex TODO list (shift-click a lot of items together on output-only mode) and then either accidentally erasing it, or wanting to do a quick lookup of where a specific item is used (adding it to the filer and enabling input searches *works*, but with WAY too much clutter. And if anything involving Avarita's 9x9 crafting shows up, it pushes the column width annoyingly wide, the two effects together being very annoying)). Or maybe a way to favourite recipes or searches that can persist even when the game is closed. Still Waiting for 1.12.2 ! Thank you for your continued interest, but it might be a while yet for 1.12. As a result of playing GTNH recently, I've discovered that the current API design could benefit from some improvements. I'd prefer to wait at least one week to see what design improvements suggest themselves in order to improve long-term compatibility. Still, thanks for the reminder; I forgot that it's been so long since I said "a month or two" about 1.11, much less 1.12. Thank you for this mod. works smoothly. I think it's fantastic, and well within the license terms, that someone likes the mod enough to have updated it independently! 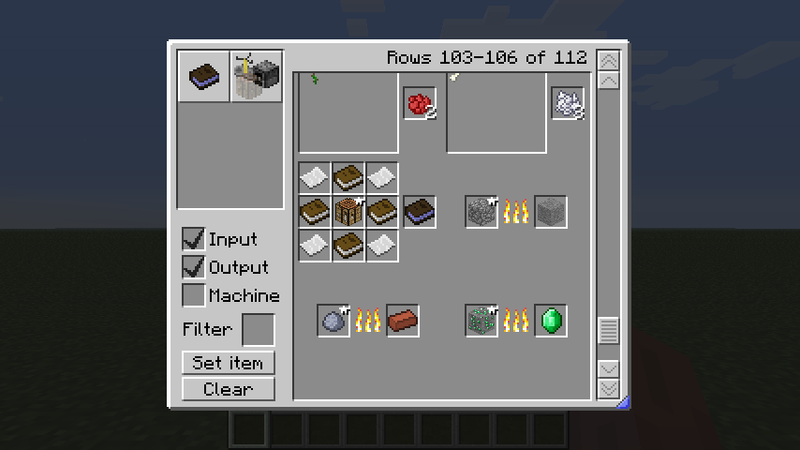 I'll reach those Minecraft versions eventually, dragging forwards some API convenience enhancements. I can't wait for the 1.11.2 version! Seriously, I can't wait. Give it to me. NOW. xD jk, hope it's out by this christmas! 1.11 might be a bit delayed; I intend to sit at 1.10 for a while (one I get there, although it's promising that after fixing compile errors, the first successful 1.9 build worked almost perfectly), to let the bugs settle, and avoid the need to backport any new features. At the moment, I'm planning a timeframe along the lines of a month or two, though, not the literal years of 1.7.